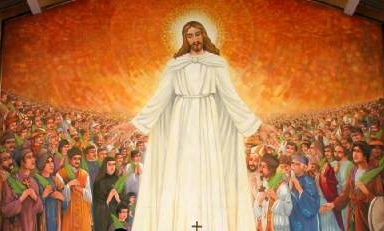 Between the arrival of the first Portuguese missionary in 1533, through the Dominicans and then the Jesuit missions of the 17th century, the politically inspired persecutions of the 19th century, and the Communist-led terrors of the twentieth, there have been many thousands of Catholics and other Christians murdered for their faith in Vietnam. Some were priests, some nuns or brothers, some lay people; some were foreign missionaries, but most were native Vietnamese killed by their own government and countrymen. Record keeping being what it was, and because the government did not care to keep track of the people it murdered, we have no information on the vast bulk of the victims. In 1988, Pope John Paul II recognized over a hundred of them, including some whose Causes we do have, and in commemoration of those we do not. They are collectively known as the Martyrs of Vietnam (or Tonkin or Annam or the other older names of that country). Son of Duke Godfrey III of Brabant. Made a canon of Liege, Belgium at age 12, a political appointment for guaranteed income rather than a religious vocation. He gave up the position at age 21 to become a knight under Count Baldwin V of Hainault, a bitter enemy of his native Brabant. He talked of going on Crusade, but never did, and eventually realized that religious life was calling him. He became a canon of Liege again, this time as a true vocation. Archdeacon and provost of Brabant. Bishop of Liege in 1191. Albert of Rethel, cousin of Count Baldwin and uncle of the Empress Constance, wife of Holy Roman Emperor Henry VI, had sought the episcopacy. He appealed to the emperor for help; Henry removed Albert from the position and made a third candidate, Lothaire, who was the provost of Bonn, Germany, the new bishop of Liege. Albert then appealed to the Vatican, both for himself and to help clearly establish the Pope's supremacy in the matter. Celestine III declared Albert's election valid, and returned him to Liege. Lothair refused to surrender the see; Henry backed him, and forced the priests in the diocese to submit to Lothair. 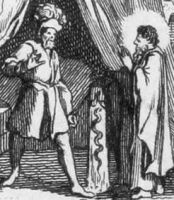 Bruno, archbishop of Cologne, Germany was supposed to ordain Albert, but refused, fearing the emperor. William, archbishop of Rheims, France, ordained Albert as priest, and then as bishop. In an attempt to end the matter in the emperor's favour, a group of Henry's knights ambushed and murdered Albert on the road outside Rheims. The plan backfired, however, as Lothair was excommunicated and exiled, and Henry was forced to submit to Rome and do penance; lay investiture (civil control over ordinations) took another serious blow. Summoned across the Alps to LeMans by his uncle, Saint Julian, missionary bishop of the area, who ordained him. Missionary to the area around the river Gironde. Noted for being backward, shy, introverted, and a lousy preacher, he still made converts one after another, healing, exorcising demons, and quietly bringing the Gospel to the pagans. Worked especially with the sailors of the area. When Julian died, Romanus returned to LeMans to mourn and to care for his uncle's tomb. Other people were buried nearby in order to be near a saint, and a group of monks dedicated to caring for the graves, and who called themselves the Grave-Diggers grew up around the churchyard. Romanus joined them, and spent the rest of his days caring for the tombs, bringing the faithful to their final resting place, and bringing the comfort of the faith to the mourners. Daughter of Giovanni and Giovannina Sala; fifth of eight children in a pious family. Educated in the convent school by the Sisters of Saint Marcellina in Vimercate, Italy. She wanted to join the Sisters, but her family needed her help, and Maria returned home. In 1848, her family obligations fulfilled, she returned to the Sisters, and made her profession on 13 September 1852. Over the next four decades she taught at the Marcellina schools in Cernusco, Chambery, Genoa, and Milan. Diagnosed with throat cancer in 1883, she kept the matter to herself and continued to work for another eight years. Throughout the beatification investigation and recognition everyone involved stressed Maria's quiet dignity and her unwavering devotion to Christ no matter how severe her pain or trying her circumstances. Born to Muslim parents. She and her mother converted to Christianity - Flora was raised Christian, her brother Muslim. She was often abused at home for her faith. 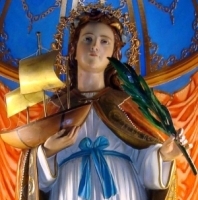 She took a private vow of chastity, and ministered to Christian prisoners. When her parents announced an arranged marriage to an Islamic man, Flora and her Christian friend Mary ran away, briefly hiding with the home of Flora's sister. The sister, however, feared being accused of harboring Christians, and threw the two out. Her brother publicly betrayed her to the Islamic authorities. She was imprisoned and scourged, escaped, was recaptured, and martyred as part of the persecutions of Abderrahman II. Spiritual student of Saint Gildas the Wise. Followed Gildas in his work in Brittany (part of modern France). Monk. Known for his gift healing men and animals. Murdered by a nobleman refusing the man's summons to heal some rabid dogs; Bieuzy stayed at the monastery for religious services. Martyr. Studied at the seminary of the Paris Foreign Missions Society, beginning in 1829. Ordained in 1832. Missionary to Tonkin (modern Vietnam). Arrested for his faith in 1836. During his two years in prison, where he was regularly beaten and tortured, he was appointed titular bishop and vicar apostolic of western Tonkin. Son of Lenin. Poet. Royal bard, poet, musician, court historian, and genealogist at Cashel, Ireland. Adult convert at age fifty, being baptized by Saint Brendan the Navigator; he had become involved with Brendan and Christianity while helping recover the stolen shrine of Saint Ailbhe from a lake. Priest. Evangelist in Limerick and Cork. 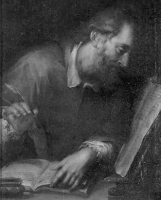 Teacher of Saint Columba. Bishop of Cloyne, county Cork, Ireland. Born to the Italian nobility. Priest. Bishop of Milan, Italy c.330, serving the rest of his life over 20 years later. Supported Saint Athanasius of Alexandria against the Arians. Attended the synod of Sardica in 343, and used it as a platform against Arianism. Slave. He ran from his masters, and sought refuge in Miaranda monastery, Auvergne, France. He became a monk there, and later abbot. At one point he demanded that the Merovingian king, Thierry of Austrasia, release his Auvergnate prisoners; Portianus was so influential, the king agreed. Priest. Functionary of the vicarius Urbis. Christian teacher of Saint Anastasia of Sirmium, the daughter of the Roman noble Praetextatus. Thrown into prison during the persecution of Diocletian, he comforted Anastasia by his letters. Martyred under Diocletian. Descended from the royalty of Munster. In his youth, Kenan was one of fifty hostages given to King Leogair by the Irish princes as a guarantee of peace. Freed by the intercession of bishop Kiaran. Spiritual student of Saint Martin of Tours in France. Knew Saint Patrick who admired him and his writing skills. Bishop of Duleek, Ireland. First in Ireland to build his cathedral in stone; it was built on the site of a pagan altar he destroyed when he converted the people. Princess, the daughter of King Saint Edwin of Northumbria and Saint Ethelburga of Kent. Cousin of Saint Hilda of Whitby. 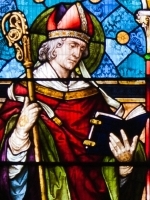 Baptized by Saint Paulinus of York. Great supporter and patron of Saint Wilfrid of York. Married to King Oswy of Northumbria, and mother of Saint Elfleda. Widowed. Benedictine nun at Whitby, which was then under the leadership of her daughter Elfleda. Friend of Saint Flora, and ran away with her, briefly hiding in the home of Flora's sister. The sister, however, feared being accused of harboring Christians, and threw the two out. Betrayed to the Islamic authorities by Flora's brother, she was imprisoned and scourged for her faith, escaped, was recaptured, and executed. Martyr. Priest in the apostolic vicariate of West Tonkin. Worked with bishop Saint Peter Dumoulin. One of the Martyrs of Vietnam. Maiden martyred in the persecutions of Diocletian. Benedictine monk. Abbot of Cava, Italy from 1208 to 1232. Priest. Worked with bishop Saint Peter Dumoulin. Martyr. Doctor at the university of Bologna, Italy. Dominican, received into the Order by Saint Dominic himself. Missionary to Germany. Died while singing the Psalm, Cantate Domino canticum novum (Sing a new song unto the Lord). Martyred in the persecutions of Maxentius. Benedictine monk at Maurienne in Savoy (part of modern France). Hermit near Chandor Abbey. Martyred by Saracens. Seventh century monk and abbot of the monastery of Saint Symphorian in Vivaris, province of Berry, France.